Researchers scanning the skies just got a big surprise. 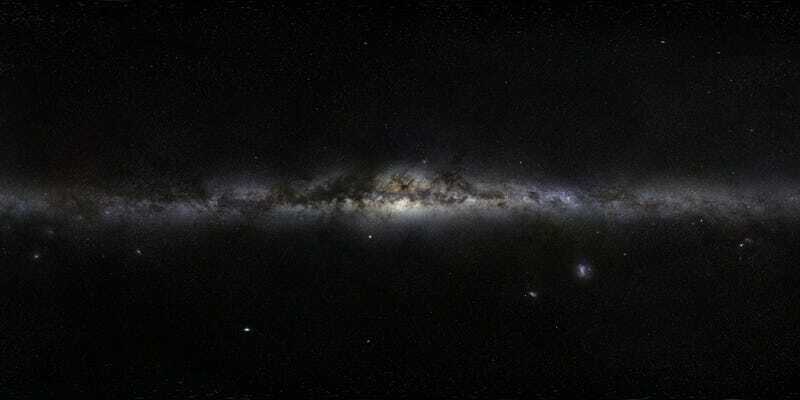 They spotted a humongous galaxy orbiting our own, where none had been seen before. It appeared, seemingly, out of nowhere. So, just how did the newly-discovered Crater 2 manage to pull off this feat, like a deer leaping from the interstellar bushes to stare us down through our collective headlights? Although the appearance may seem sudden, the fact is that Crater 2 has been there all along. We just missed it. Now that we know it’s there, though, there are a few other humiliating details that astronomers discovered. First of all, we can’t blame the galaxy’s size for its relative obscurity. Crater 2 is so enormous that researchers have already pegged it as the fourth largest galaxy orbiting our own. We can’t blame its distance, either. Crater 2's orbit around the Milky Way puts it right in our neighborhood. That said, how did we still not know it was there? A new paper out in Monthly Notices of the Royal Astronomical Society from researchers at the University of Cambridge has an answer for us. It turns out that, despite being large and close, Crater 2 is also a pretty dark galaxy. In fact, it’s one of the dimmest galaxies ever spotted in the universe. That, along with some much brighter neighbors, let the galaxy that researchers have nicknamed “the feeble giant” escape detection until now. Now that we have seen Crater 2, however, the discovery raises questions about what else is out there. Researchers are already talking about mounting a search for similarly large, dark galaxies around us. It’s a good reminder that there’s still so much about space that we don’t know.